In the end of March, about 2-3 weeks after I bought the 1963 Levin LM-26, I was offered a 1959 Levin LM-26 that I couldn’t resist, even though I already had one from that year. 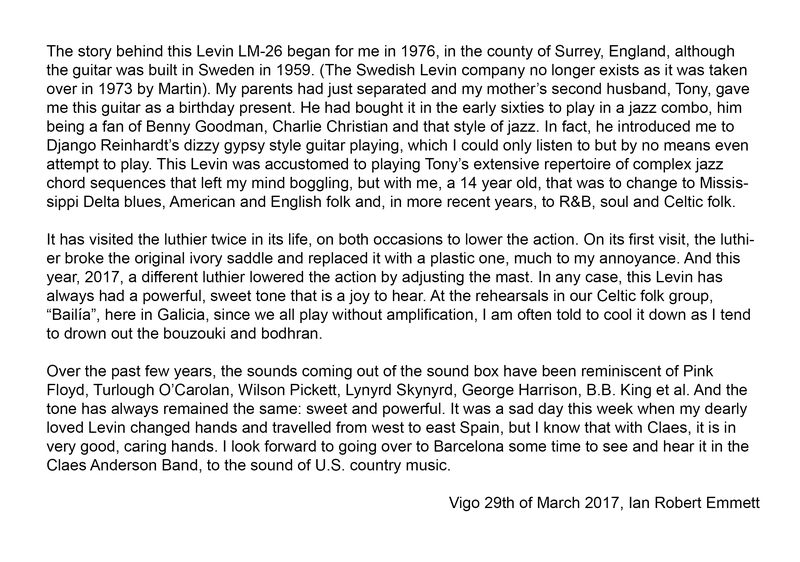 The seller Ian was quite persistent that I added his guitar, that he had owned since his 14th birthday in 1976, to my Levin collection so I of course complied. The guitar has been used playing anything from jazz, Mississippi blues to Celtic folk and now country, read Ian’s guitar history. Now I have one Levin LM-26 built in 1963 and two from 1959, well they actually both has a body stamped in 1958 but with a 1959 neck, not sure if they did a lot of bodies one year and necks the next. I have some Levin LT-18 that has a Goya serial number stamped inside and a completely different Levin serial number on the head, I guess these things happens at a guitar factory. This 1959 Levin LM-26 seems to be completely original, it even has the cheap looking machine heads that Levin used in the late 1950’s on the LM-series. On my other 1959 Levin LM-26 the machine heads were replaced by open back Grover’s by the second owner back in 1965 and I think I might have to do the same on this one. I like the ones they used on the Levin LS-18 at the time, they are rounder and look more Gibson like, these square ones look like something from an Egmond or a kids guitar. The guitar plays really nicely and sounds great, really full and warm as could be expected of an all solid Swedish built guitar from the late 1950’s. Yesterday I sold my 1979 Fender Stratocaster, which felt a bit sad. I’ve had the guitar up for sale for two years so it was no surprise that sooner or later she would leave me. Then again, when it actually happened I missed her a bit. Well guitars comes and goes, that’s the circle of life and she needed to make room for her sister, my new 1978 Fender Telecaster. Last Sunday I got to use the Stratocaster one last time when we had a gig with the Claes Anderson Band. It sounded great, really twangy even through my solid state Levin amp from the 1990’s.